Isida 8Терморегулятор, регулятор влажности большой мощности. Klimat 5Терморегулятор, регулятор влажности средней мощности. Klimat 4Терморегулятор, регулятор влажности малой мощности. Set #1 temperature sensor 2 pcs. Set #2 temperature sensor 1 pcs. ; relative humidity sensor 1 pcs. Set #3 temperature sensor 2 pcs. ; relative humidity sensor 1 pcs. Digital temperature sensor (accuracy ±0.2°C). Electronic relative humidity sensor (accuracy ±5%). Also, to measure the relative humidity, the thermostat can use a psychrometer consisting of dry and wet temperature sensors. The thermostat automatically adjusts its operation to the available set of sensors. a) incandescent lamp power up to 800 watts. a) solenoid valve with flow Adjuster of the water. Measures and regulates the temperature. Measures and controls relative humidity. Controls the mechanism of trays turning. An additional channel for auxiliary equipment. When using the module SSR-25DA thermostat controls the heater power up to 4000 Watt. The time generated by the timer at each position from 1 min. to 999 vby. The maximum power connected to the output channel №1 not more than 800 Watt. The maximum power connected to the output module SSR-25DA up to 4000 Watt. The maximum power connected to the output channel №2 not more than 800 Watt. The maximum power connected to the output tray turning mechanism not more than 500 Watt. Unit Dimensions not more than 130х110х40 mm. 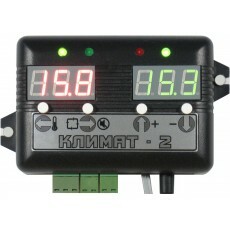 Heating Controller "KLIMAT" 1 pc. Power adapter 220V/12V/1500mА 1 pc. Operating Instructions manual 1 pc. Wiring diagram of the increasing power module SSR-25DA.